How Do Military Family Members Enroll in DEERS? The Defense Enrollment Eligibility Reporting System, also known as DEERS, is an enormous database of people who are eligible to receive military benefits, which includes health insurance coverage provide by TRICARE. But others include access to commissaries and exchanges, ID cards, life insurance, and education benefits. 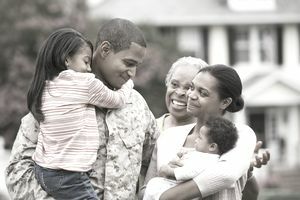 Because service members (including active duty and eligible Reserve and Guard personnel) are automatically enrolled in DEERS, many military families (including the service members) assume that the service member's dependents are automatically enrolled as well. It is not the case. Enrolling spouses, children, and other qualified dependents requires a separate step. If they don’t get registered in DEERS, they won’t be able to enroll in TRICARE or access any of the other benefits to which they’re entitled. Fortunately, registering family members in the DEERS system is quite simple. Service members can enroll their dependents in DEERS anywhere that is authorized to issue military and uniformed-services ID cards. This enrollment must be done in person. Before you pile into the car and drive down to the ID-issuing facility, make sure you have all the documentation you’ll need, including marriage certificates, Social Security cards, photo IDs, birth certificates (for biological children under 21), adoption papers, and divorce decrees. If you have children ages 21-23 who are full-time college students and you want to keep them covered by TRICARE, you’ll need a letter from the college’s registrar’s office verifying the child’s enrollment. To enroll stepchildren, you'll need to provide their birth certificate, social security card, and parent's marriage certificate. Enrollment for adopted children requires their social security card, birth certificate, and final adoption decree. After you've gathered all the required documents, you’re ready to go. Again, DEERS enrollment must be done in person because the sponsor will have to fill out and sign DD Form 1172. This document is the Official Application for Uniformed Services Identification Card and DEERS enrollment form. During this process, spouses, dependent adults and children aged 10 and up will receive military ID cards. It sounds a little overwhelming, but once a servicemember’s dependents are registered in DEERS, you won’t have to schlepp anywhere to update your information or make changes. There are a variety of ways to do this. Calling DEERS Support, 1-800-334-4162 (California only), 1-800-527-5602 (Alaska and Hawaii), or 1-800-538-9552 everywhere else in the US. What Are Some Tactics for Getting Through Coast Guard Boot Camp? Can You Join the Military With a GED?